These are a great way of raising funds at any event - they are easy to sell and you can choose the prize that you give away. 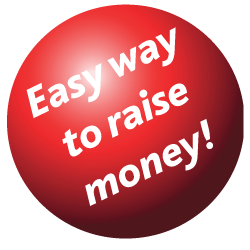 Everyone knows what to do and will have a go - raising lots of money for your fund. Wether they are for a spring fayre, a summer festival, an autumn festival or xmas; we can help you raise money for the minimum amount of fuss! Our tickets come in books of 5 or 10, measuring 2 3/8 x 6 inches, they are usually printed black on white paper to save you costs, but we can print any colour and any size if you have a special format that is unique to you. They are available in any amount, but are usually sold in the following quantities: 1000, 2000, 3000, 4000, 5000, 6000, 7000, 8000, 9000, 10000, 15000, 20000, 25000, 30000, 35000, 40000, 50000 and 100000. Printed black with 5 choice colours. 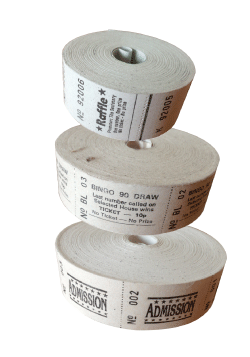 Excellent perforation for easy separation of tickets. Available in 5 up or 10up random spinners. These can be used anytime, anywhere for almost anything! 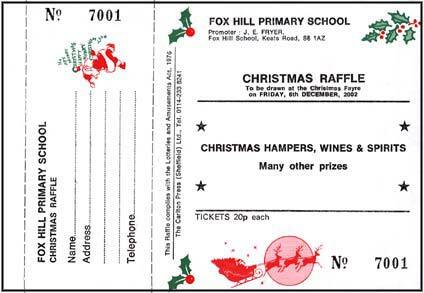 A very versatile money raiser or ticket. Size 2.25 x 6 inch. Available on tinted paper in standard, large and extra large sizes. With or without counterfoil stitched in 5's, 10's etc. Available in: 1000, 2000, 3000, 4000, 5000, 6000, 7000, 8000, 9000, 10,000, 15,000, 20000, 25,000, 30,000, 35,000, 40,000, 50,000 and 100,000.